Moreover, PCHR also documented the arrest of journalist ‘Amer Balousha in the Gaza Strip on grounds of expressing his opinion on social media. Though what ‘Amer did does not violate the freedom of opinion and expression as explained in the International standards and even domestic laws, the Public Prosecution in Gaza filed a criminal case against him of many accusations, including “misuse of Technology” and incitement against the government and planning for holding protests through the social media. Yusuf Salem, ‘Amer’s lawyer, said to PCHR’s fieldworker that ‘Amer’s detention was extended to 15 days pending further investigation as he is so far under arrest. 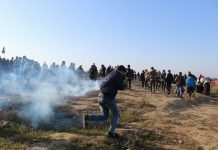 During the past years, PCHR’s periodic reports regarding the freedom of opinion documented several cases in which the Public Prosecution in the West Bank or the Gaza Strip worked on filing lawsuits against journalists and opinion makers despite the insufficient evidence and sometimes not having any. These measures aim at forcing journalists into a swirl of legal procedures and detaining them for several days pending further investigation as the authorities in the West Bank and the Gaza Strip attempt to promote a state of self-deterrence in order to mute the critical speeches. PCHR condemns the state of the relationship between the authorities in the West Bank and Gaza Strip as you can say that there is now an oppressive executive authority, which hides behind the law and judiciary. PCHR also stresses that freedom is an inalienable right and the authority was established to protect it, underscoring that freedoms should not be confiscated under any pretext.